Sorry for the recent site outage. Google AppEngine made an incompatible change to their system last week, and I was out of town and unable to correct the problem until today. Hopefully everything is working OK now. If you're a user of Google Reader, you may have noticed all the ways you can interact with the content you're reading. I think most users are pretty confused about these options - and how they should be using them. Add Star - I believe most people use this as a form of favoriting - they want some mechanism to remember this particular post, and find it easily later. Share - Google using this to indicate that you want to share this item with friend that follow you on Google Reader, or in your publicly shared collection of stories. Like - This is a form of light-weight commenting on a story. Whenever someone has visibility to this item, your name will appear below the item as someone who has "liked" it. Share with note - This is actually quite different from "Share". 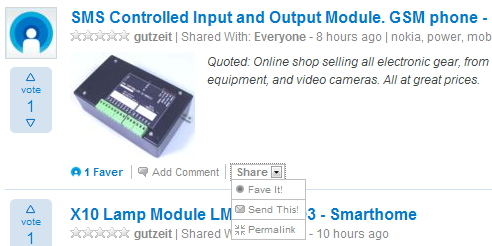 When you "Share" an item, you redistribute the original item to your followers and public shared page. If you "Share with note", you are creating a new item which links to the original, and has your personal comment attached at the top. Comment - Once an item is shared (by you or someone else), you and your followers can add comments to it. This can be a complete comment thread at the bottom of the story. This is a lot of options, and seems pretty confusing for users; especially when you consider all the possible combinations of options that a user has. FriendFeed and Facebook have fewer options: basically just "Like" and "Comment"; the Share option is basically implied by these actions. On Faves.com, we have the option to Share ("Fave It"), and Favorite (a side effect of an Up Vote), as well as adding a comment (if the author is a friend of yours). Faves actually has an even finer grained permissions model once you do share something; you can save a Fave for "me", your "friends", or the "world" (public). Favorite (or Star or Subscribe) - This should be a private gesture to help the user save the item for future reference. I view this action as an explicit "subscription" to this item. You are indicating that you want to remember this, and would also like to be able to see if there is future activity related to this item. It would also be useful to allow users to add their own tags to favorited items, to further help in searching or browsing for saved items. Like - It's very useful to have a casual gesture that is like a one-click comment. By Liking and item, you should, as a side effect, become subscribed to it just as if you had starred it. This gesture is viewable by other users who have visibility to the item. 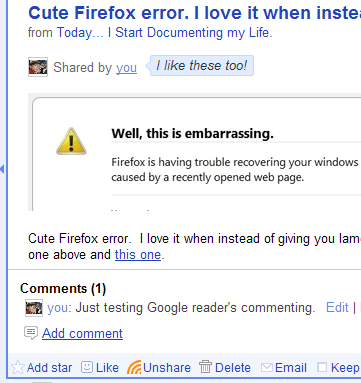 Comment - Just like "Like", with additional comment text added to your annotation. There is arguably a need to enable private comments, or those that are restricted to an inner circle of friends or co-workers. Share - This option is really only needed for "off-site" publishing of the item. For example, if you want to send it via email, or post it to twitter (if you don't automatically tweet all your Liked items. Report - In any social community, there will be some users who abuse it for self promotion or SPAM. Users should have a simple gesture to mark innappropriate items that should not be included in the current stream. Google can be responsive to problem reports - and a real person will investigate reported problems. 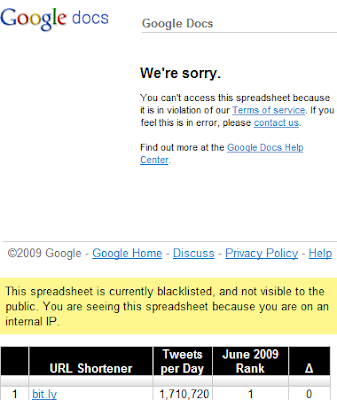 I am happy that Google is working to reduce the spread of spam and mal-ware on the Internet. I would have appreciated some form of prior notification before my spreadsheet was blocked. Notice that Google has never explicitly identified which link they object to. Are they worried that this would allow spammers to game the system? Are they afraid of libel suits or allegations of restraint of trade ? I should take a bit more care in adding sites to this list. I have reviewed most of the domains to make sure they are bona fide URL shorteners; it can be difficult or impossible for me to determine if they are used as vectors for spam or malware. This teaches that if you want to express yourself freely on the Internet - you should refrain from using Google publishing sites. Tr.im Planning a Shut-Down, then Donates All to "The Community"
Eric Woodward has reversed his decision to shut down link shortening site, tr.im by the end of the year, and instead donate all the code and data assets to "the community" to continue to operate in the public domain. It's a magnanimous offer, and one which, I'm sure, will gather some supporters. But these announcements are coming out pretty fast, and it does seem that some of their decisions are being made too rapidly to carefully plan the transition. But Eric has silenced all doubters by personally guaranteeing the financial viability of the service from his own personal funds. While he does not specificially address the structure of the new tr.im, it sounds like he will be setting up an independent not-for-profit foundation to own and operate the assets of tr.im (though the source code will be open-sourced). It's an interesting wrinkle in the story. Will the "open" mojo be enough to materially impact the position of tr.im amongst url shorteners? This is reminiscent of social bookmarking site, Ma.gnolia (which subsequently lost all of their user data), and micro-blogging site, Jaiku - (now an open-source Google Service being operated as a 20% project). Open-sourcing is not a panacea, but it may inject enough life into a foundering project to remain a valuable piece of the internet infrastructure and community.